The terms ‘Eczema’ and ‘Dermatitis ‘are interchangeable. 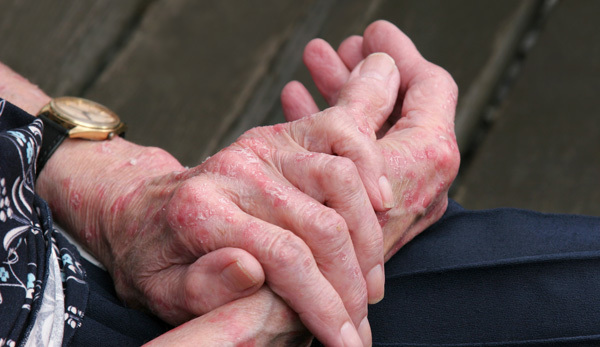 Eczema is a general term for many types of skin inflammation (dermatitis). Eczema/dermatitis can be either acute or chronic or both. When acute, one sees a rapidly evolving red rash which may be blistered and swollen. When chronic, one sees a longstanding irritable area that gets darker than the surrounding skin and looks much thickened (lichenified) and scratched. Atopic dermatitis is a chronic condition, characterized by itchy, inflamed skin and is the most common kind of eczema. It is more common in children who have other allergies, like asthma and hay fever. As kids get older, atopic dermatitis clears from the face but can later develop in the elbows, behind the knees, and/or on wrists and hands. If the child scratches the affected area, which often happens, the skin may become infected. It usually clears up as the child grows older and is usually gone by adulthood. It can flare up and then settle down for no apparent reason. The condition is sometimes referred to as Allergic contact dermatitis. The inflammation isn’t caused directly by the chemical, but by an allergic reaction in the skin. Common triggers are creams, gels, lotions, and shampoos; antiseptics in hand creams; fragrances and deodorants; hair dyes and bleaching agents. Some people are allergic to jewellery metals like nickel and cobalt, and get dermatitis from the area of watches, jean studs or buckles that come in contact with their skin. Caused by the direct chemical effect of substances such as detergents, solvents, acids, alkalis, oils and skin cleansers. It’s common among caterers, cleaners, nurses, builders, hairdressers and mechanics. The hands are often affected. Also known as ‘lichen simplex chronicus’, this type of dermatitis typically develops when something has created an itchy sensation in a specific area of your skin. This irritation may lead you to rub or scratch that area repeatedly. Common locations include the ankle, wrist, outer forearm or arm and the back of your neck. Underlying factors include dry skin, chronic irritation and eczema. The skin becomes thickened with increase of normal skin markings. This is more commonly referred to as the “winter itch” and is seen in extremely dry skin. It worsens in dry winter weather; hands, legs and trunk are mostly affected. The itchy, tender skin resembles a dry, cracked, riverbed. This type is common among the older age group. Other conditions that affect circulation in your legs, such as pregnancy or deep vein thrombosis. The skin is itchy with a cracked, superficially fissured skin with slight scaling. The disorder can make the individual prone to leg ulcers. The main cause of eczema is thought to be a defect of the skin that impairs its function as a barrier, along with an abnormal function of the immune system of the body. In people with atopic dermatitis, genetic deficiencies lead to abnormalities in certain proteins that are important in maintaining the barrier function of normal skin. Some forms of eczema can be triggered by substances that come in contact with the skin, such as soaps, cosmetics, clothing, detergents, jewellery, or sweat. Changes in temperature or humidity, or even psychological stress, can lead to outbreaks of eczema in some people. Reduce how often you bath or shower, use lukewarm water and avoid hot long water baths. Replace standard soap with a substitute such as a mild soap-free cleanser. Wear soft cotton clothes; wool, nylon is best avoided. Protect your skin from dust, water, solvents and detergents. Apply the moisturizer into the skin in the same direction that the hair grows. Be gentle in application of the moisturizer. Corticosteroid creams are sometimes prescribed to decrease the inflammatory reaction in the skin. These may be mild, medium or high potency corticosteroid creams depending upon the severity of the symptoms. For severe, wide spread and non-responsive cases, a short course of oral steroids may be used. It should be used only under the guidance of a medical practitioner. In case of severe itching, oral anti-histamines may be required. Both Tacrolimus and Pimecrolimus are topically applied immunosuppressant creams that reduce itching and inflammation. They are not associated with the skin thinning side effects of steroids.